If you’re in the market for door stops, you have a few choices open to you. The most versatile option of all is most definitely our range of door wedges, which are capable of holding a door open, protecting walls from impact damage and are conveniently portable. 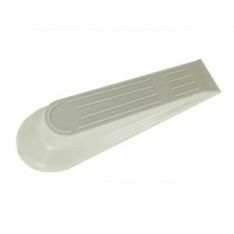 The plastic door wedge and the more common rubber door wedge are both appropriate for the intended purpose, but there are other types of wedges for doors available too. But if you need something a little more permanent and sturdy, you’re in the right place. Our floor door stops are designed to remain flush to the floor and are generally affixed with a screw or nail. Their elegant spherical shape and small size makes them subtle yet functional, and they’re available in a variety of sizes and metal finishes. If you prefer a more cylindrical format, our skirting door stops should provide just the thing. These stoppers are attached to a wall or skirting board and fulfil the same job as the floor mounted variety. Available in a range of models and metal finishes, these offer a robust defence against slamming doors and can be tailored to suit your home’s inherent style. No matter what you’re looking for, Ironmongery Experts is here to help. If you’d like to place an order over the phone, please refer to the telephone number at the top of the page.